A pioneering new instrument that produces the sharpest images of young stars could give astronomers a fascinating glimpse into how the solar system may have looked more than 4.5 billion years ago. An international team of experts, including Professor Stefan Kraus from the University of Exeter, are carrying out new research into how planets form using a ground-breaking new infrared imager. The imager, called MIRC-X, is designed to give new insights into how planets form from the rotating, circumstellar discs of dense dust and gas that exist around young stars. While conventional telescopes can only see the outer disc region of these fledgling stars, due to the sheer distance they are from Earth, the new imager can produce images from the depths of the very inner regions. The research team believe that the research will not only give a far greater understanding of how these stars—found several hundred light years away—form but also give a glimpse into how the solar system would have looked at its very formation. Professor Kraus, from the University of Exeter's Physics and Astronomy department and principle investigator of the MIRC-X instrument said: "The big prize in planet formation studies is to understand what happens in the very inner regions of these discs, on the scales where Earth is located in our solar system. "In these very inner regions, the disc undergoes a dramatic transition from a dust+gas composition to a purely gaseous disc. The strong pressure gradient in the region might lead to a pileup of dust grains that could trigger the formation of rocky planets in the region." The research team, which also includes experts from the University of Michigan (USA), created the MIRC-X imager to provide far sharper images of the very inner disc regions for the first time. The team utilised the CHARA telescope array, located on Mt. Wilson in California and operated by Georgia State University, to help produce the final images. This facility incorporates six, one-metre telescopes spread over an area 330 metres in diameter. The MIRC-X instrument combines the light from all six telescopes at the same time, effectively creating the resolving power of a giant 330-metre telescope. The feat of combining these 6 CHARA telescopes has already been achieved by an earlier instrument, MIRC – built by the University of Michigan – which acted as the precursor to MIRC-X. "We achieved landmark results in stellar astrophysics, for instance by imaging spots on the surfaces of other stars, or the fireball expansion phase of a nova explosion," said Professor John Monnier from the University of Michigan and principal investigator of MIRC. "However, in order to achieve the challenging goal of imaging young stars, we needed to redesign and rebuild the instrument substantially." One of the most important aspects of the redesign concerned the camera that is used to detect the faint signal produced by superposing the starlight from the six telescopes. "We needed a camera with extremely low noise, but at the same time also a very high frame rate in order to freeze any image distortion introduced by the atmosphere," explained Professor Kraus. "Fortunately, there has been a real breakthrough in detector technology a few years back that has resulted in a new generation of infrared cameras with 40 times lower noise than before. 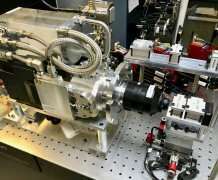 It is the world's fastest, low noise, infrared camera and freakily close to reaching the fundamental physical limit of single photon detection, making it nearly the 'perfect' camera for our purposes." In late 2018 the team achieved "first light" with the full new MIRC-X system—the moment when the new instrument captured starlight the first time, with the innovative system. "We were off to a successful start of our observing campaign and can't wait to analyse the data that we recorded," said Professor Kraus, "The images will show us how the solar system might have looked like 4.5 billion years ago, at the time when Earth and the other planets formed. " "Whenever astronomers have turned on a machine that is an order-of-magnitude more capable than earlier generations and pointed it at the sky, they discovered exciting new things about the Universe," Professor Monnier added. "I hope the same will be true with our new instrument. The instrument team includes scientists from the University of Exeter, University of Michigan, and the Institut de Planétologie et d'Astrophysique de Grenoble. The MIRC-X project received funding by the European Research Council and the University of Exeter and builds on earlier funding from the USA's National Science Foundation. The team thanks First Light Imaging SRS for a fruitful collaboration and Fujikura Europe Ltd for providing a sample of their optical fibres. Here's a great paper describing in considerable depth the entire setup at MIRC-X: https://arxiv.org...3809.pdf entitled "MIRC-X/CHARA: sensitivity improvements with an ultra-low noise SAPHIRA detector". More info on the C-Red One camera used: https://www.first...red-one/ and info on the Saphira detector used in the camera: https://www.leona...aphira-1 . The speed of this camera/detector system is awesome!